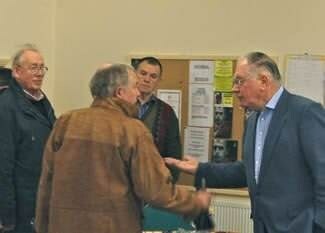 With the agreement and support of Councillor Les Goodman, Chairman of the JPC, members of the Market Action Group were able to conduct an exit poll at the exhibition of the plans for the redevelopment of the Henley Market site, held on Saturday 5th February at the Baptist Church Hall. Members of the public attending the exhibition were asked to sign a petition stating either: “I support the revised plans” or “The revised plans do not address my objection to the original Planning Application”. Of those who signed the petition, 82% said that the revised plan did not address their objection whilst 18% supported the revised plans. Many of those exiting the exhibition said that their main concerns remained valid, with the density of the development, the inclusion of 3 storey houses, the predictable increase in traffic, particularly at peak times and the failure to address the anticipated ‘on-street’ parking, especially by occupants and visitors to the houses fronting Prince Harry Road, being cited as their main objections. 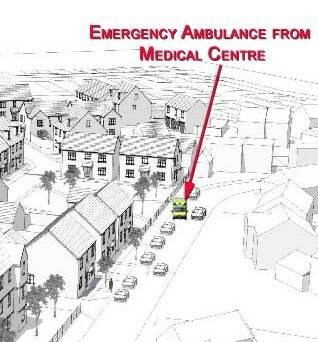 There was a specific concern that, with Prince Harry Road being the only vehicle route to the Medical Centre, ambulances and other emergency vehicles would be obstructed by parked cars, as happened recently. The JPC was well represented at the meeting and many visitors said that Councillors were very positive about the plans, which seemed contrary to the views of the majority of residents. The result of the exit poll is being forwarded to the Chairman of the JPC and hopefully he will ensure that residents’ views will be taken into account when they meet to discuss the Planning Application on 14 February. This will be an excellent opportunity for the JPC finally to engage with residents and take account of their wishes; you are urged to attend this meeting. JPC Chairman (right) debates with resident Peter Knight. Our Ward members on Stratford District Council, Councillors Stephen Thirlwell and Jem Jones, are also invited to engage with their electorate and listen to their views. So far they have not made their own views clear, apparently preferring to remain non-committal on the subject. Even though you may have written before, if you still have concerns about Taylor Wimpey’s plans for Henley Market, please make your views known to Tony Horton, Planning Officer, at Stratford District Council. He will accept comments by email at planning.applications@stratford-dc.gov.uk or you can write to: Mr Tony Horton, Planning Officer, Stratford upon Avon, Stratford on Avon District Council, Elizabeth House, Church Street, Stratford upon Avon, CV37 6HX. 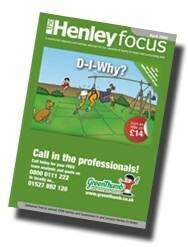 Henley NEWS has asked our district councillors to publish their views but no responses have been received. Henley NEWS also invites the developers to reply to these continued concerns and will published any response in the next edition. Is Henley NOW An Urban Area? The planning guidelines for Rural and Village locations recommend a much lower density of properties than for Urban Developments. By defining the Henley Market site as an Urban Development the architect is able to argue that the design meets planning guidelines whilst incorporating high density housing. 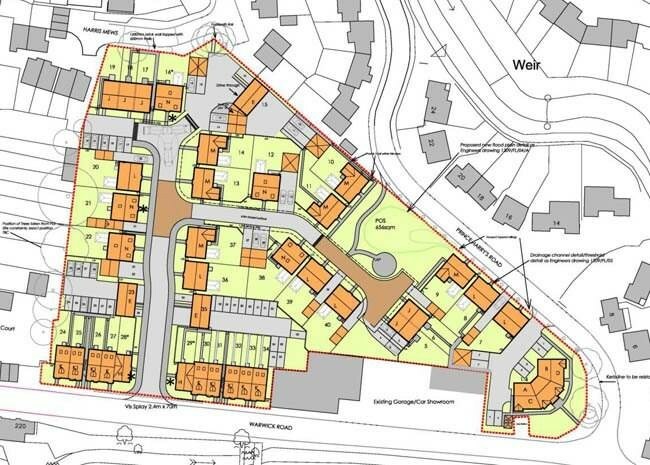 Most people who objected to the revised plans said that there were too many houses for the size of the site. This leads to more traffic, more congestion, inadequate parking provision and more pollution, all issues raised by residents. In the same letter Barton Willmore state; “The overall scheme has been developed in full consultation with the District Council, Members, the Joint Parish Council and the local community and at all times, we have sought to ensure that all the competing issues have been adequately addressed to the satisfaction of the relevant bodies”. Whilst the developer consulted with the JPC, they don’t appear to have consulted with groups such as the Henley & Beaudesert Society or the Market Action Group, which represent the views of residents of Henley. 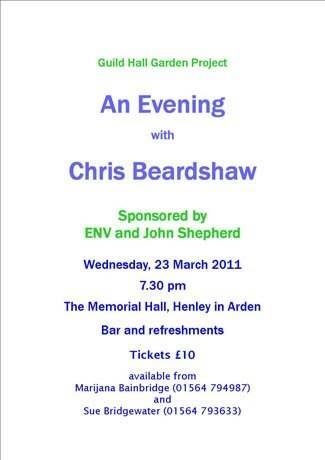 They also refused the invitation by Henley NEWS to publish their plans following the exhibition in the Baptist Hall in July 2010. The planning process requires the developer to consult local communities and to take their views into consideration; if they haven’t consulted you how do they know your views? More importantly how can they claim “...that all the competing issues have been adequately addressed to the satisfaction of the relevant bodies” ? 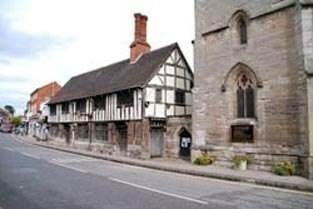 Elizabeth House, Church Street, Stratford upon Avon, CV37 6HX. I would like to express my concerns over the market development. I personally do not want the development as proposed. When the new plans are discussed at the JPC would you please take note of my views and vote accordingly. Name withheld but known to JPC. Mr Mike Faulkner, a resident of Prince Harry Road, had concerns about the planning application submitted by Taylor Wimpey for the Henley Market re-development. He attended the special meeting convened by the JPC at the High school on 2nd December 2010 and listened attentively to all the points raised by those who spoke. He gave careful consideration to everything that he had heard and decided to submit his views thereafter by email to each and every member of the JPC in order that they could take his concerns into consideration when reviewing the planning application. As he wanted to ensure that every member of the JPC had received and read his email, he attended the JPC meeting on 6th December 2010 in order to ask a question in the public open forum. 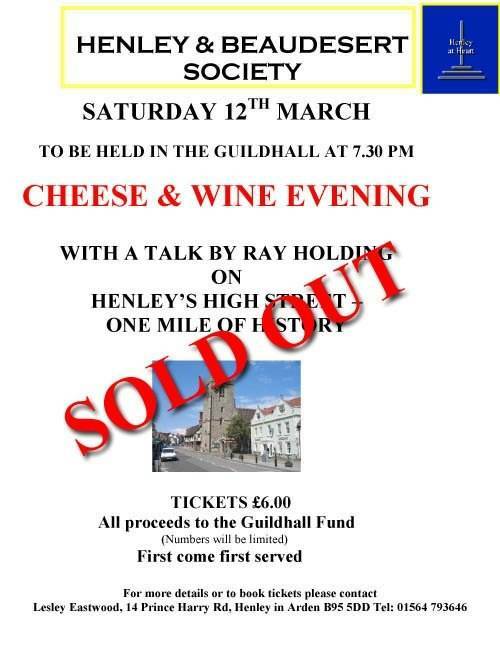 Before any members of the public were allowed to speak at this meeting, the chairman, Cllr Les Goodman, declared that no comments regarding the Henley Market re-development planning application would be permitted. After this statement, the Chairman saw that Mr Faulkner had raised his hand in the public gallery and the Chairman invited him to address the meeting. Mr Faulkner explained that he wished to make reference to the planning application but the Chairman immediately intervened and demanded that he should not do so. Mr Faulkner persevered to the extent of simply asking if each parish councillor had received his email. Cllr Les Goodman said he had received the email but that he found the last paragraph of Mr Faulkner’s email offensive. Cllr Les Goodman refused any response from Mr Faulkner. Later in the public open forum, a representative of the Henley Society was invited to speak and was allowed to do so uninterrupted by the chairman Cllr Les Goodman on the subject of the Market redevelopment even though he had prevented Mr Faulkner from doing so minutes earlier. Mr Faulkner felt so concerned by his experience that he referred the matter to the Standards and Ethics sub-committee of Stratford District Council. Their summary response, without further investigation, was that they had read Mr Faulkner’s email to Cllr Les Goodman and they did not consider it to be offensive. They had also read the minutes of that JPC meeting and took the view that Cllr Les Goodman was exercising a robust chairmanship of the meeting. 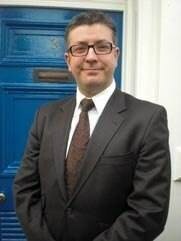 Mr Faulkner has asked that the sub committee commence further investigations including interviewing those present, some of whom may share Mr Faulkner’s view that Cllr Les Goodman’s conduct and behaviour toward him went so far as to be considered offensive and damaged his public reputation. Whilst Cllr Les Goodman acknowledged receipt of Mr Faulkner’s email and made reference to his views, he did not refer to the content of the email or the paragraph he found offensive or why. 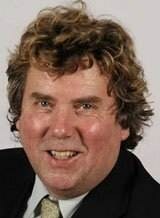 That left members of the public without the benefit of understanding what had caused Cllr Les Goodman to be offended. Since Mr Faulkner was not allowed to speak again this could have left a perception within the room that Mr Faulkner had been offensive and in so doing damaging his reputation amongst his friends and neighbours. Henley NEWS invites Cllr Goodman to reply and hopes his reply will be published in the next edition. I'm very disappointed by the response from the Clerk to the JPC. I was simply seeking a fair and reasonable solution to put this to rest but now, as a consequence of the Clerk's decision, I will pursue this through the Standards and Ethics committee. I'm sure that the JPC will be aware that by doing so they will be spending a considerable amount of public funds and involving many councillors and Henley residents in sparing time to be interviewed as part of the investigation. 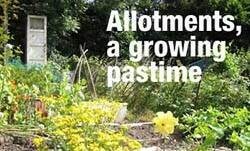 I wonder if Cllr Les Goodman is aware of this? Perhaps the Parish Clerk could draw it to his attention for I'm sure as part of their enquiries the Standards and Ethics committee would like to know this. Ms Walsh perhaps you could explain to me why you feel so strongly against permitting this and indeed if Cllr Les Goodman was involved in that decision for I'm sure many Henley residents, particularly those present on the night in question, would like to know. It was announced this week that the petition signed by over 12,000 residents of Warwickshire asking that the closure of the youth service be reversed was presented by Chris Spreadbury to the leader of Warwickshire County Council on the steps of Shire Hall. There is a good article on BBC Coventry and Warwickshire Website. Henley’s contribution to the petition was well over 500. There is reason to believe that the campaign is beginning to have some effect. At the Warwickshire County Council cabinet meeting on the 27th January there were a few alterations to the original budget paper as outlined in November, reducing the savings by 1.5 million. However, the paper would be presented to full Council very much the same as the November report. One million pounds will be put back into Youth Work, and Peter Hatcher, the Senior Youth Officer for Warwickshire, is being asked to look at how this would work. It is believed that this will be revenue, so is not just for one year. News is awaited about the early intervention grant to discover if any of this will be used to fund Youth Work. Statements by the spokesperson from WCC appear to hint that some Youth Workers might well be employed via this grant in Targeted Youth Support Teams. Final decisions will be made on February 15th when there will be a huge demonstration outside the County Hall from 10.00am. It is a pity that those most affected by the expected changes will not be able to attend since they will be in school. Identical copies of the letter attached were sent by my wife and myself to Cllr Mike Perry and Cllr Timms at their respective offices on the 19th January 2011. 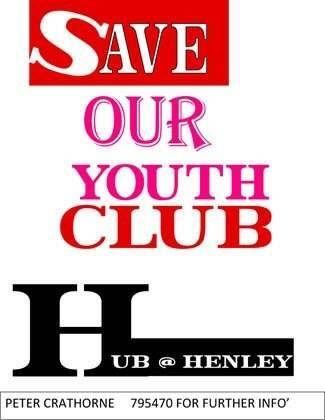 These deal with the important subject of protecting the Youth and Community Service from cut backs or closures, not only in Henley but also the rest of South Warwickshire. Up to the time of writing to you, we have not received a reply. That they have no interest in the opinions of their electors. They already know the answer but it is so bad they do not have the courage to tell. 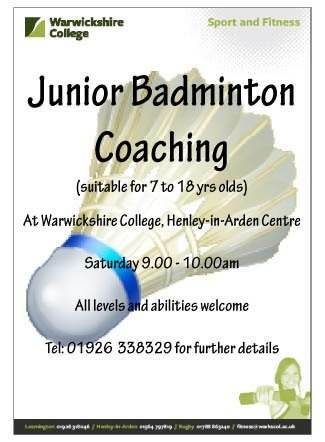 They have no interest in the subject as they feel that the youth of Warwickshire are not important. This list is endless and if any of these suppositions are correct they are in danger that the voters of Warwickshire may feel "disappointed to the extent of being disillusioned and in very great risk of them becoming disaffected". I do hope that you publish this letter and that the two councillors take notice as asked. Malcolm and Jo Coulter - Henley-in-Arden Residents. On Monday 7th February over 50 residents gathered at the award winning Naya Restaurant for a meal to raise funds for the Memorial Sports Grounds Pavilion Development Fund. 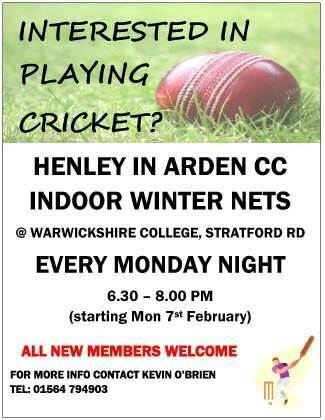 This will support the sports clubs in Henley and help towards a plan to refurbish the Sports Pavilion to make it worthy of the achievements of our clubs. The generosity of Ahmed and his staff and sponsorship by We Are First Service, chauffeur driven cars made it possible to raise just over £850. The meal was a selection of customers’ favourite dishes, served by the friendly and helpful staff who joined in with the party atmosphere generated by everyone sharing in the support of a worthy cause. I would like to make readers aware that our Library has been named as one of 16 Warwickshire Libraries considered to be 'no longer sustainable' in its current form by the County Council. The 16 library buildings facing closure to save £2 million, have been identified as being "no longer sustainable in their current form". They are: Baddesley, Harbury, Bedworth Heath, Hartshill, Bidford on Avon, Henley in Arden, Binley Woods, Keresley, Bulkington, Kineton, Camp Hill, Kingsbury, Dordon, Studley, Dunchurch and Water Orton. Henley NEWS has asked the managing trustees of the building for a statement and hopes it will be published in the next edition. 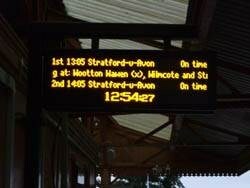 Parish Cllr John Love has sent Henley NEWS photos of the new information signs which have recently been installed to replace the telephone information system. 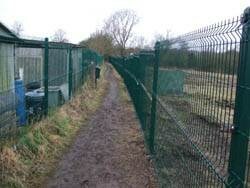 Cllr Love also photographed the new fencing for the allotments. 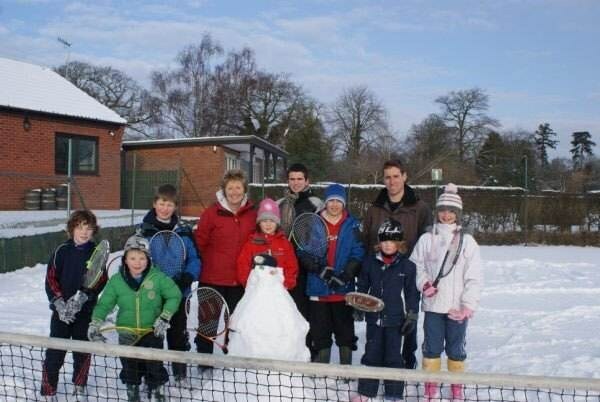 Henley in Arden Tennis Club is setting up another new tennis session for youngsters. Total Teen Tennis will be held every Saturday starting on the 5th Feb from 1 – 2pm and 11 – 16 year olds will be able to receive quality tennis coaching for only £1! So, if you are interested in starting tennis or coming back why not give it a go and bring a friend. The sessions are open to all standards and will help you improve your tennis whilst meeting new friends and socialising. 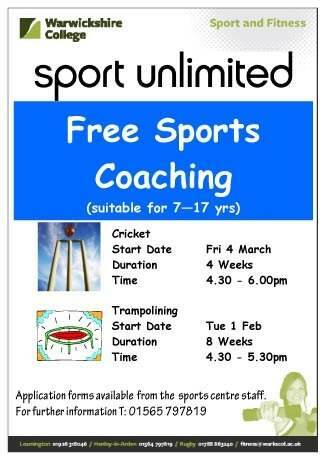 If you are interested in coming along then please contact Neil Supperstone on 07912 66 44 26 or email neil@coolsportz.co.uk. Places will be allocated on a first come first served basis. Please visit www.coolsportz.co.uk to find out about all of the other sports sessions the club runs for juniors and adults. “It’s been a particularly busy and rewarding few weeks for the club,” commented Rotary President Alan James (right). In a veritable blizzard, members braved the elements and, thanks to the generosity of the few who ventured into the town on the Saturday before Christmas, nearly £300 was raised for local charities. Then, on the following Monday, the club hosted a sell-out charity concert in the Memorial Hall by the Midland Youth Jazz Orchestra. The audience were treated to a superb display of musicianship from this award-winning band which thoroughly deserved the standing ovation which it received at the end of a memorable evening. Sponsorship was received from Johnsons Coaches and the interval mince-pies were kindly supplied by the Co-op. As a result £1,000 went into the charity fund which was increased by a similar amount at a Beef and Burgundy Evening held at the Guild Hall in January. The club was particularly grateful to caterer Sue Dalby who supplied (and cooked!) the beef. The Hall was packed for an enjoyable and successful occasion. This busy period has enabled the club to support a number of local and international causes. On the home front, primary schools in Henley and surrounding villages will again receive support for visits of the Life Education caravan making children aware of health issues, and every child in one of the top classes in each school will receive a special full-size dictionary at the end of the school year. In addition the club will finance a holiday for a deserving child in the Rotary District’s Mablethorpe Children’s holiday project. Meanwhile the club has given financial support to Cancer Research and, again, to Warwickshire Air Ambulance. Internationally the club has, through the Rotary ShelterBox scheme, given shelter and basic essentials to 10 victims of the devastating but little-publicised floods in Colombia. Finally, the club will be backing Stratford Rotary’s water supply project for earthquake-torn Haiti. Yes, it has been a busy few weeks! MBA INTERNATIONAL is a firm of executive search consultants (head-hunters) providing high calibre executives to the financial services and professional practices industry. Our photo shows the senior management team. 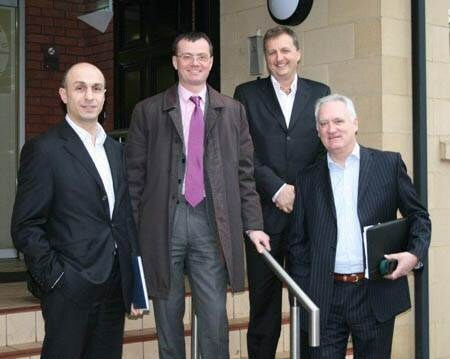 From L to R: Stephan Papantoniou, Mark Bointon, Marc Howells, Jim Bain. Our expanding business has necessitated a move to larger premises. We have opted to move to the top floor of Forward House, 17 High Street, Henley in Arden. At the moment there are 16 of us, but we are actively recruiting sales, marketing research/resourcers. The latter might suit ladies with children at school, as we can be very flexible on working hours and days. Plimsoll, the recruitment analysts has prepared a list, in their latest publication, of “The Top 19 Best Trading Partners” among the 456 recruitment companies. MBA occupies the 9th. position. 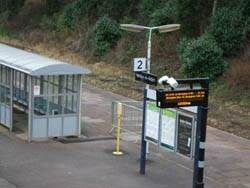 In choosing Henley we were persuaded by the beautiful environment and the easy access. Something old for Someone new!! Generous mums from Stratford and Warwick have been able to support a charity based parent group in Coventry. The fundraising team at Birth and Baby Reality wanted to find a novel way to support other local families, but hoped to avoid asking people to put their hands in their pockets in these trying economic times. Claire Paley from their fundraising team came up with the fantastic idea of asking parents to donate good quality used clothing, bedding and accessories, which could then be donated to another local charity, and the mums at Birth and Baby Reality coffee mornings were really keen to support this idea! 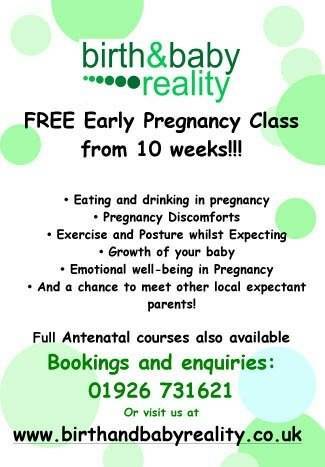 Birth and Baby Reality also aims to support local mums by offering a Free Early Pregnancy Class which is held in Rother House Medical centre each month. “We hope to improve people’s understanding about health in pregnancy, thereby improving birth outcomes for both mothers and babies. It doesn’t matter what background you come from, all parents love to learn about their baby’s development and have the opportunity to meet other local people in the same situation! !” We also offer postnatal support at our weekly coffee mornings which usually include a relevant speaker and are always well attended by mums from across the area. St John’s Church, Henley and St Michael and all Angels in Claverdon have jointly raised some £57,000 over the years to support the Leamington based international peace building charity, Cord. Cord has over four decades of experience in helping people to help themselves out of poverty and towards a peaceful future in programmes involving those who are in the ‘bottom billion’ - the poorest people in the world. Currently 42 million people affected by war and conflict have been forced into exile as refugees or are displaced within their own country. 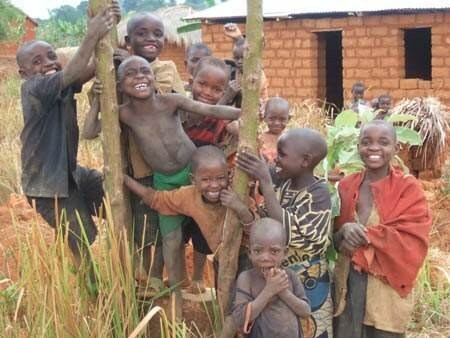 Half of them are children and most live in the poorest parts of the world. Since 1967 Cord has helped well over 1,000,000 people in some of the world’s most hostile and remote environments. It takes time to build peace in a world where half of all countries emerging from conflict relapse into violence within ten years and it's back to square one. "We are enormously grateful to the churches in Henley and Claverdon for their loyal and continuing support," said Cord Chief Executive Brian Wakley. "Their generosity has enabled us to make a very real difference in the lives of so many people. Our Lent Appeal this year focuses on our Peace Heroes - people who are going that extra mile to effect world peace, and who are humbling in the work that they do," he added. Cord employs some 800 people in Africa, South East Asia and the UK. Most of the in-country staff teams and all the organisation’s partners are citizens of that country - they know the place inside out. The charity has the knowledge, expertise and inventiveness to help its partners address the root causes of conflict and essentially to help themselves. Cord’s largest programme is with 85,000 Sudanese refugees from Darfur who fled for their lives across the border into Eastern Chad. Based in four camps Cord supports 23 schools, training teachers and educating 35,000 children and young people from pre-school upwards; ensuring that a generation emerges determined not to endure another crisis like Darfur. Equally vital work is underway in Burundi where hundred of thousands are returning from exile after years of civil war. A major regeneration programme is part of Cord’s five year plan: building thousands of homes, cultivating land, protecting water supplies, erecting new primary schools and addressing the need for basic sanitation and hygiene training to prevent disease. Huge social injustice and extreme poverty still exists today in Cambodia, where the legacy of the Khmer Rouge regime and genocide killed nearly two million people, leaving 70% of the population aged 30 and under and with little capability of dealing with their tragic past. Cord’s team in Phnom Penh provides advice, mentoring, coaching and training to ten local partners, equipping them with an understanding of how to make the best of opportunities for growth and change. Cord spends £3.06 million a year on their peace building work. The charity is funded and endorsed by some of the world’s major donors - but much of its support comes from churches, schools and individuals here in the UK. 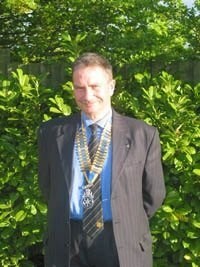 Indeed the chairman of its trustees is local businessman Malcolm Franks who lives in Claverdon. A Cord Community Ambassador will be speaking at St John’s Church on Sunday 13 March during the 10am service. Claverdon finally managed to play their league fixture against Copsewood on the fourth time of asking after bad weather had seen previous attempts cancelled. Absenteeism saw Frasier Knight drafted in to the second row with Paul Daws on the wing and Rob Horsfall slotting back in at full back. With the pitch firm under foot, Claverdon knew they would have an advantage if they could use their fast backs as often as possible. With the game only 5 minutes underway, the Copsewood defence were caught offside from a Claverdon attack. Doz Ward made no mistake to give the visitors an early lead. The lions then unusually stepped off the pace and a poor clearance saw Copsewood deep in the Claverdon half. From the resulting lineout, a well worked move saw the home team set up an effective rolling maul to go over in the corner and take the lead. The conversion was missed and Claverdon knew they were in for a battle. This was the shock that the lions needed and they soon made good yards courtesy of quick thinking by scrum half Conor Smith. Quick recycling eventually saw the ball in the hands of winger Paul Daws who made no mistake to dive over in the corner. Ward easily got the distance from the touchline but was just off target with his conversion. It wasn’t long before Claverdon scored their second try of the game. 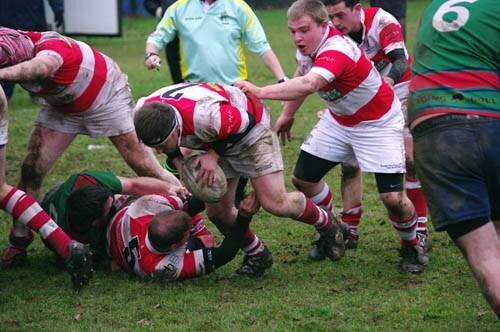 Another very effective scrum secured great ball for inside centre Tom Johnson who took the ball at pace. 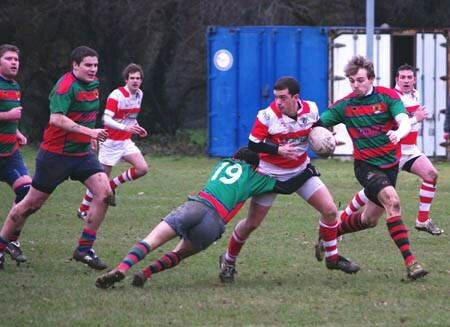 He drew 2 defenders before managing to offload a looped pass to his fellow centre Tom Bennett who outpaced his man to crash over in the corner for an unconverted try. With Claverdon now very much on the ascendancy they were playing the sort of free flowing rugby that had seen them bulldozer teams in recent matches. Chris Lowe and Chris Edsall made great tackles to push the home side back deep in to their own half. A pin point throw from Steve Grimsley and a clever tap down from captain Tom Skinner gave the backs the quick ball they thrived on. An excellent timed pass from Ward found Daws cut a great line from his wing and he easily outpaced the defence to score his second of the game. Ward made his first conversion. Straight from the kick off, Claverdon took clean ball and Copsewood couldn’t handle the pace of Smith and flanker James Barton who both gained valuable yards. Barton found supporting runner Doz Ward who handed off the full back to score next to the posts. He dusted himself down to convert the bonus point try with the half time whistle sounding shortly after. With ten minutes gone in the second period, Claverdon scored their fifth try of the match. As had been the case all game, the front row of Dave Carruthers, Steve Grimsley and Chris Lowe secured another solid scrum which again gave the Claverdon backs the platform they required. With a quick pick up from the base of the scrum, Smith drew his man to find centre Johnson who gathered the ball at pace to secure another converted try. Doz Ward had been excellent with his place kicking and with one such kick and great following up from Johnson and winger Ian Wyllie, the Copsewood full back was driven back over his line. The home team attempted to clear only for the ball to find its way perfectly in to the hands of winger Daws. He turned and found a tiny gap to accelerate through three defenders to score his third of the game. Ward missed the conversion. Copsewood were not lying down and they forced the lions back to within 5 metres of their own line. Great defensive work kept the home team at bay but this was at the expense of Chris Lowe who was knocked out and replaced by youngster Anthony Cauvin. The change gave Claverdon a much needed lift and they were soon back camped in the home team’s half. Great phases of open rugby saw both Tom Skinner and Jean Visser within yards of scoring but they were just held up short. When Frasier Knight was tackled just short, Steve Grimsley spotted a gap in the Copsewood defence to dive over and continue his impressive scoring record this season. Ward easily made the conversion and the full time whistle sounded to end another well drilled performance from the lions. Claverdon face a tough encounter this Saturday as they travel away to face rivals Old Wheatleyans and aim to continue their winning ways. Now is the perfect time to take advantage of all of the outdoor dining options available. A hog roast allows you and your guests to experience the beauty of the outdoors while enjoying a delectable, freshly prepared meal. A hog roast does just that. When your guests smell the succulent meat, they won't be able to resist. Not only is a hog roast delicious and unique, but it's also versatile. Arden Pig Company can easily adapt your hog roasting plans to any size or style of event. Whether it's a wedding, a small backyard birthday party, a corporate gathering or a community celebration, Arden Pig Company can both plan and carry out your event. Although the figures initially appear disappointing when comparing them with this time last year, January 2010 was an exceptional month with only a few incidents recorded. The incidents recorded for January 2011 are comparable with recent months and the Alcester North Area is still a low crime area in comparison to other areas. Criminal Damage has increased on last year, but again it is comparable with recent months. The majority of incidents being recorded in the Studley area with incidents recorded for smashed windows to commercial premises, damage to garden fencing and some graffiti. 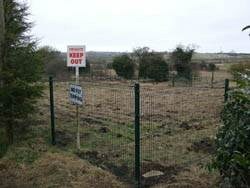 Around 20 feet of fencing was damaged at Birdcage Walk in Henley, the section of fencing borders The Mount and was damaged sometime between 8pm 24th January – 8am 25th January. In Earlswood somebody has driven into the barrier at the entrance to the Lakes car park and left the scene without reporting the accident. Anti Social Behaviour incidents have increased slightly when compared to this time last year, however it is comparable with recent months. Studley has experienced the majority of issues around the High Street and Crooks Lane areas with reports of youths acting rowdy and in some cases under the influence of alcohol. Officers are continuing to patrol ‘hotspot’ areas and are making effective use of the Dispersal Zone and Alcohol Restriction Zone. Vehicle Crime has increased with vehicles being reported as stolen in Henley, Wootton Wawen, Earlswood, Ullenhall and Studley. However the vehicle stolen in Henley has since been recovered having been taken by a relative whilst underage and without consent. Theft from Motor Vehicles has increased slightly with fuel stolen from vehicles in Studley by drilling into the fuel tanks; commercial vehicles have also been targeted in the Studley area with tools being stolen. In Preston Bagot a vehicle in a car park was forced open and a sat nav was taken. In Henley and Earlswood there has been reports of number plate thefts and in Tanworth a Land Rover Defender was stripped of parts. Residents are reminded to remove as many items from show as possible and where a sat nav is removed it is advisable to remove the cradle and suction marks from the window as this would otherwise indicate the likelihood of a sat nav being in the vehicle to a would be thief. Overall since April the 1st vehicle crime has reduced on the Alcester North Area by -7.9% when compared to the same period last year. Violence has increased on this time last year, but is comparable with recent months. Most of the incidents are recorded in the Henley, Studley and Tanworth areas. Those recorded are of a minor nature and have been dealt with appropriately by officers. Any amount of alcohol affects your ability to drive. There is no foolproof way of drinking and staying under the limit, or of knowing how much an individual person can drink and still drive safely. Why isn't the limit zero? 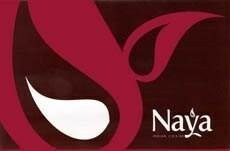 Even without drinking, some alcohol can be present in the body from other sources, such as when produced by the fermentation processes in the digestion of certain foods, or as an ingredient in mouth wash. This means that a zero limit isn't practical. Anti Social Behaviour, Studley Town Centre - 10 x targeted high visibility patrols. Parking outside One Stop/Co-op, Henley High Street – 12 x targeted patrols to give advice to drivers parking dangerously. Speeding in Wootton Wawen, A3400 – 8 x targeted speed checks to be carried out with advice and/or enforcement where appropriate. Following a house burglary in Ullenhall on Tuesday 11th January 2011, a vigilant member of the public helped police by calling us and giving vehicle details for the offenders. Within 40 minutes of attacking the house four men were stopped in the car and arrested in possession of some of the stolen property. Three have now been charged with the burglary and are awaiting court appearances. Police are grateful to the witness for his help, stressing that without which, we could not have locked up and dealt with the offenders so promptly. Four persons given Formal Warnings by Henley Pub Watch regarding their future conduct. A vehicle which was reported as stolen in Henley was recovered by officers and one of those responsible was found to be a relative who had taken the vehicle whilst underage and without consent. A member of the Safer NEIGHBOURHOOD Team successfully located a number of garden ornaments in Earlswood, which had been moved from one garden to another. It is unknown who is responsible for removing the ornaments, but they have since been returned to the rightful owner. A representative from the Safer NEIGHBOURHOOD Team attended Henley High School and assisted Year 9 pupils with their Business Enterprise Day. Warwickshire and West Mercia Police Authorities have invited their respective Chief Constables to explore the potential for delivering more effective and efficient policing services across both force areas. Following consideration by both Authorities, Warwickshire Chief Constable Keith Bristow and West Mercia Chief Constable Paul West have been asked to consider the merits of a strategic alliance between the two forces which, forces and Authorities believe, could deliver real benefits more quickly than any other partnership or collaboration work ongoing at this time. Both forces and Police Authorities already have innovative change programmes designed to ensure that forces continue to deliver the maximum protection possible to local communities at a time of reducing budgets. Warwickshire Police has to reduce its budget by £22.9 million over the next four years and West Mercia by a total of £34 million. A team has been tasked with developing proposals for more efficient and effective policing services that maintain or increase levels of protection to local communities. Local policing team arrangements are excluded from the review work. West Mercia Assistant Chief Constable Simon Chesterman has been appointed by the two forces to lead a Strategic Alliance programme team. A joint blueprint with recommendations will be presented to both forces and Authorities by the end of May 2011 for their consideration. Both forces and authorities have been keen to stress that a merger of the two forces is not an option. Warwickshire and West Mercia forces are both actively engaged in local discussions with other public services and with police colleagues in the West Midlands region and beyond. Both forces already share a number of services with others forces including, for example, police air support and counter terrorism work and the exploration of other potential partnerships will continue in parallel with strategic alliance work. The next Community Forum will be held 23rd March, 7pm, Studley Youth Club - If you have a specific concern then come along to the local surgery, where you will be able to speak to your local Safer NEIGHBOURHOOD Policing Team, Warwickshire County Council or Stratford District Council Officer. 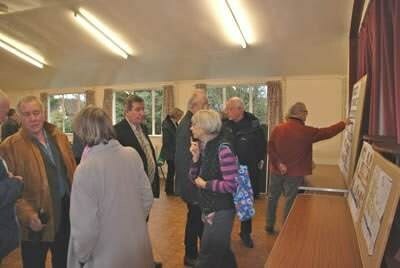 The next Henley Community Surgery will be held, 30th March, 11:30am, Henley Baptist Church Hall - The surgery gives you the opportunity to speak to members of the Parish Council & Safer NEIGHBOURHOOD Policing Team about the issues that concern you, while giving you feedback regarding what is happening in the community. The next Henley Police Surgery will be held 16th February, between 11am – 1pm, Henley Police Station - A drop in facility to discuss issues/problems within the community with your local policing team. (Mac users don’t need to worry, they can continue to be self-righteous). We hear this week that yet another major security bug has been found in Windows. This one only affects you if you use Internet Explorer – as indeed most PC users do. You may well be sick of hearing that yet another Microsoft product hasn’t been properly developed, they really do have a terrible history of this. It amazes me how one of the largest companies in the world can put so many unfinished or untested products on to the market. Hackers can take advantage of this loophole to steal sensitive information or redirect users to malicious websites. Microsoft researchers are apparently still looking into developing a complete fix for it, (because they didn’t do the job properly in the first place) but they have released a temporary fix which will prevent the majority of attacks. However there’s an easier solution: Internet Explorer is the only browser affected by the problem so switching to a different browser will also protect you. There are several other browsers available and all are free of charge to use. A good alternative is Firefox and I confess I’m a great fan of it, in part because it has nothing to do with Microsoft. It’s simple and straightforward to use and it will remember all your usernames and passwords for you if you want it to. For a while now there has been a free alternative to Microsoft software for use on your PC. You don’t need to buy Microsoft Office any more (Word, Excel, PowerPoint, etc) as there is a great alternative in the Open Office suite of programmes which does all that Office does and more. You can find out more about this at www.openoffice.org . Finally I learn that a foreign language version of Windows (Windersxxxx) has been produced for those who live north-west of Birmingham. You may enjoy learning about it. Click on the image right to view the screen shots. To pause, click on pause icon bottom left (Windows) or press space bar (Mac). 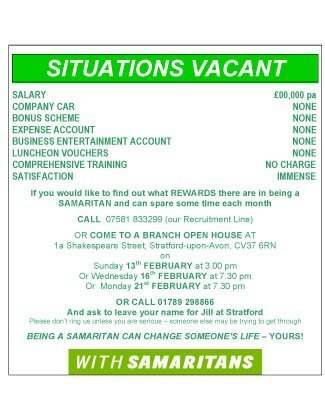 Situations Vacant – Volunteers Needed! Does anyone know of a semi/recently retired person who might be interested in giving something back to the community by becoming a Trustee of Henley War Memorial Trust? HWMT is responsible for the Memorial Hall (which is already wonderfully managed by Duncan Bainbridge and his team) and the Sports Grounds and Pavilion. It’s the Sports Grounds and Pavilion team that could use some extra help in the management of this part of the organisation. Replies to: jancrathorne@gmail.com or peter.crathorne@gmail.com or phone us on 795470. Many thanks. Would anyone be willing to become Auditor of the Youth Club accounts? It is not an onerous task and the accounts are presented in good order. As above, please contact Jan or Peter Crathorne if you are able to help. Again, many thanks. HWMT need a Volunteer Quantity Surveyor to give advice on architect’s drawings for the proposed re-furbishment of the sports pavilion, in order that the project management team might arrive at a reasonable figure for the cost of the project. For more details, please contact Peter Crathorne, as above. If you have a vacancy, please advise the Sits Vac Editor, Jan Crathorne or 01564 795470. You Can’t Win It – So Bin It! Throughout February, Warwickshire consumers are being urged to ‘bin a scam’ in support of ‘Scamnesty’, the national month long scams awareness campaign, Warwickshire Trading Standards Service has announced. ‘Scamnesty bins’, located at main libraries and one stop shops across Warwickshire will be available throughout the month for residents to bin their bogus prize draws and sweepstakes, scam lotteries and advanced fee fraud letters. Trading Standards Officers will then collect the bins, identify issues and then shred them! The email alert system is a quick and simple means by which Warwickshire Trading Standards can alert interested individuals, community organisations, businesses, charities and others to the latest Trading Standards issues/scams etc. Please feel free to cascade this information to whom ever you feel appropriate (including using the information in your newsletters/websites etc.). Please ignore the Restricted Notice on the bottom of this page - this is automatically generated but is not meant to apply to the information in this email. The email alert system is designed to work as a two way communications system. Therefore, if you have any information you wish to provide to Warwickshire Trading Standards Service, either for our information, or to appear in future email alerts, please email me. Tickets for concerts, festivals and sporting events often sell out very quickly and it is tempting to search the internet for somewhere that can provide them. However, be careful as 1 in 12 people are scammed by fake ticket websites. These very convincing websites claim to sell event tickets that are never delivered, leaving fans without tickets and their money. So follow our advice and don't let them con you. Ask yourself: How can this website guarantee tickets to an event that is already sold out, or that are not on sale yet? Never buy event tickets from a website you're unsure of. Ask others about it and search online for comments. Solar Panels; to buy or not to buy ? So, why think about solar panels now? Well, when we looked at them a couple of years ago, we found them extremely expensive and there were a few unresolved issues with them for our house. Prices are now lower so we are looking again. There are two types of solar system. Solar thermal puts heat into your hot water tank. In summer it can provide most of your hot water and in winter it helps to heat the water. Partially heating the water in winter still saves energy, though not as much as in summer. Typically, solar hot water systems provide about 60 to 70% of the heat energy used in domestic hot water. When we looked at this, we found that because there are only two of us in the house and we are very frugal with hot water, a solar hot water system would not save a lot of carbon pollution and not save much money either. However, for a family it might be worthwhile and it’s especially worth considering if most of your hot water is heated electrically. There are two types of solar thermal collectors: evacuated tubes and flat panels. The tubes are more efficient at collecting the heat, which means they will be smaller than a flat panel of similar output, but they are expensive and only seem to be worth considering if roof space is restricted. Flat panel systems start at just under £4,000. 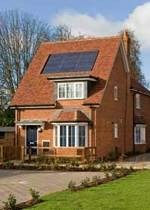 Photovoltaic (PV) solar panels on your roof (or in the garden if you have a suitable space) make electricity which can be used in your home and when you do not need the power, it will be exported to the grid. You will be paid for what you export at 3p per kWhr and you will also be paid 41.3p per kWhr for all power generated, whether you use it or export it. Most systems are installed without an export meter and the electricity companies assume that you export half of what you generate, so the effective payment to you is 41.3 + 1.5 = 42.8p/kWhr and this is tax free, RPI indexed and guaranteed for 25 years from the date of installation. With typical electricity prices paid by domestic consumers of around 11 or 12 p/kWhr, you might think that a 25 year guaranteed tax free index linked 42.8p/kWhr is rather generous, but it needs to be, because PV solar systems cost in the region of £5,000 to £13,000 depending on size. Typical payback times are in the region of 8 to 12 years for roofs facing between South East and South West and rather longer for East or West facing. Roofs facing anywhere between West North West and East North East are probably not suitable. Also, quite small shadows can cause a disproportionately serious loss of output. Being unsure about the size of the effect of a shadow from a chimney was one of the reasons that we did not buy solar panels two years ago. The other was the high cost. We have now confirmed that the chimney in our case causes a loss of less than 1% of annual output and prices of panels have come down considerably, so we are getting quotes. 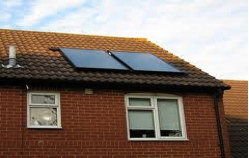 A recent MORI poll showed that the value of properties with PV installations could be enhanced by over £10,000. Some companies will give additional discounts if a group of customers get together in an area and agree to have their panels installed one after the other. The savings arise because the scaffolding company can take the scaffold form one home to another on the same day and the solar panel installers can bulk buy the panels. So, if anyone is interested in joining a buying group, please give me a call on 01564 792251. Even if you do not wish to join a buying group, but would like further information about solar systems, I am happy to give you help; I now have quite a lot of technical knowledge about panels and systems and performance and calculating the effect of shadows. If you want to look into matters yourself, a good starting point for PV is the website found by searching for PV-GIS using Google. Savings in carbon pollution from a 4kW system are in the region of 3 tons per year. If on the other hand you wish to save a lot of energy, carbon pollution and money without spending thousands of pounds, give Rockwarm a call on 0800-132689 and ask about cavity wall and or loft insulation. If you want additional quotes, ask your energy supplier or call Act on Energy on 0800 988 2881. If you are interested in joining a buying group for solar panels, call me on 01564 792251. Stratford District Council has held a preliminary meeting with Malvern Hills District Council to explore whether there might be benefit for their two Councils in developing an alliance to operate services. The Leader, Deputy Leader and Chief Executive met their opposite numbers at Malvern and have asked the two Chief Executives to look at this in more detail prior to a follow up meeting in early February. Stratford-on-Avon District Council and Warwick District Council set up a Working Group last year to examine the opportunities to set up a shared management team and shared services. The Working Group concluded that they should not pursue shared management due to other pressures on the Councils but they would continue to examine the options for shared services. Councillor Stephen Gray, Leader Stratford District Council says: “We spent a long time talking with Warwick but with all partnerships there have to be benefits on both sides and as discussions progressed it was clear that this would not be the case. There seems to be great similarities between Malvern Hills District Council and Stratford-on-Avon District Council differently to Warwick and I am hopeful that this may present both Councils with potential benefits. 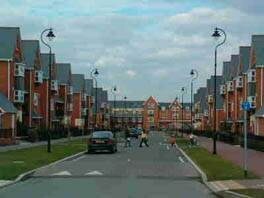 “Stratford District Council has been working in partnership with a number of Councils for a few years. Given the scale of the financial settlement, it is only natural that the District Council quizzes like minded Councils in order to look a further savings options. Any partnership must benefit both Councils and council tax payers alike." 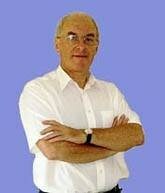 Roger Butler is going to take us “Through Wildest Russia” when we meet on Tuesday 15th February. Baptist Church Hall 7.45pm, visitors £2.00. Saturday 26th February at 7.30pm in St John’s Church Hall, Beaudesert Lane. Come and sing along to well known old time and other favourite songs. Bring your friends and have a home cooked supper and enjoy the music. 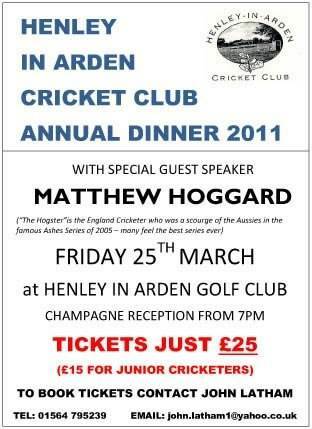 Tickets £5 to include Hotpot Supper. Cash bar and raffle. For tickets call Barbara Colclough on 01564 793710 or Barbara Warmington on 01564 793640. 28 FEBRUARY-13 MARCH A yearly reminder that our shopping choices can make a difference to people in developing countries who would otherwise have no way out of poverty. Look out for a Big Brew Tea at the Methodist Church; the annual Fairtrade stall outside St. John's and the Traidcraft stall at the W.I. lunch. Times and dates to be confirmed in March issue. Make money on your new or nearly new clothes! Good quality – preferably clean and on hangers – ladies or gents clothes required. You will receive 40% of the sale price with 60% for church funds. Contact Lesley Eastwood 793646, Barbara Warmington 793640 or Daphne Jones 01926 843515. More details nearer date. In February, Henley Churches Together will have a lunch time meeting, “Time Out with God”, with soup, on Thursday 17th at 12.00 noon at the Baptist Church. Our Sunday Services, all at 10.30 am are: 6th, Mrs Lesley Sergeant. 13Th, Revd Helen Bell (Sacrament). 20Th, Mr Telfryn Pritchard. 27Th, Mrs Elizabeth Harrison. 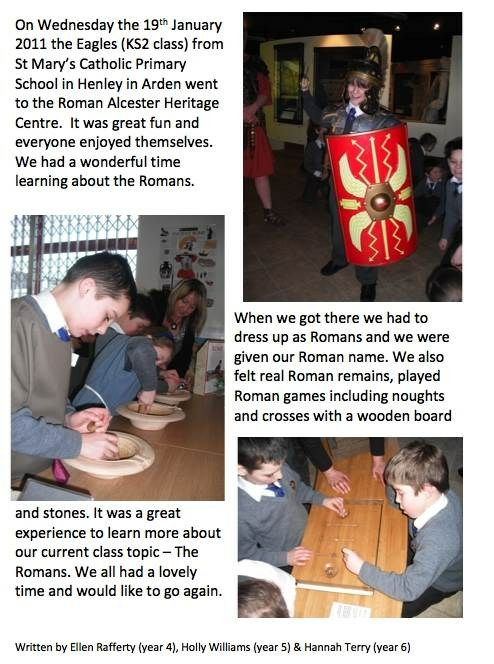 Visitors are always welcome to come and try WI, you will find a warm welcome and lots of opportunities for learning new pastimes. We have groups for Crafts, Play Reading and Walking, as well as informal social get togethers also visits to plays, concerts and shows. On the first Tuesday every month in the Memorial Hall from 7.30pm. February 1st will be “Tea Tasting with Ross”. THE WEDNESDAY CLUB FOR VISUALLY IMPAIRED PEOPLE gives a warm welcome to visually impaired people at their meetings on alternate Wednesdays in Dell Court, when they can enjoy good company, speakers, outings, and a delicious tea in a very friendly environment. If you or anyone you would like to join, please ring 792724, 794209 or 792138. 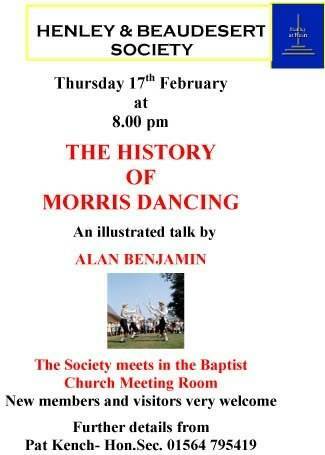 Our next meeting is on Thursday 17th February in the Baptist Church Hall at 8.00 pm when Alan Benjamin will give a talk on 'The History of Morris Dancing'. Visitors and new members are very welcome. Further details from Pat Kench on 795419. Ullenhall Village Hall February 22nd 7.30pm. 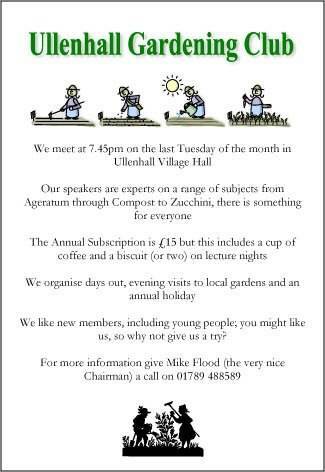 Speaker is RHS Wisley trained Don Everitt on “Lilies & Summer Flowering Bulbs”. (Plant stall). Visitors and new members always welcome at this very friendly club. Has your community done anything it is particularly proud of in the last 12 months, which is worth celebrating? 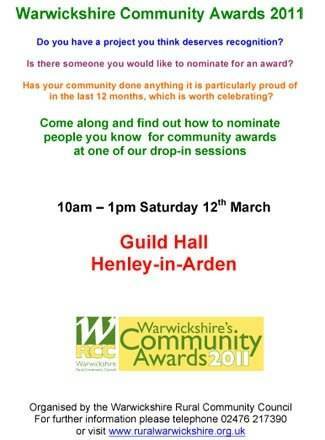 Come along and find out how to nominate people you know for community awards at our Henley-in-Arden drop-in session. 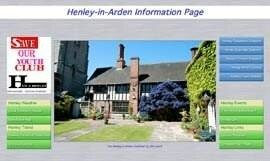 10am – 1pm Saturday 12th March - Guild Hall, Henley-in-Arden. TORQUIL POTTERY Saturday Workshops Saturday 26th March and 2nd April 2011 9.30 am to 12.30 pm. AVON COMPUTING FOR EVERYONE If you would like to learn how to surf the internet, email friends and relatives, produce professional looking correspondence, organise and edit digital photos, expand your knowledge of Microsoft Office and more. All in a friendly and relaxed atmosphere working at your own pace then we are the people to help you. Classes commence 4 March 2011 £52.00 for 6 weeks (2 hours per week) For further information contact Jean Bunn on 01789 204042 or 07849 810 814. RIVERLAND GARDEN The Garden Committee is organising two further events to complete the Riverland Garden. On Wed 23 March, TV gardener Chris Beardshaw will give a talk on all aspects of gardening and answer questions. Further details will follow, so reserve the dates in your diary. Now would also be a good time to Buy a Brick as the third brick panel will be installed shortly. Further details on all of these from Douglas and Sue Bridgewater on 793633. 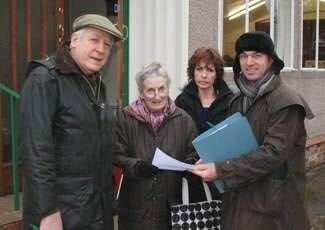 This association meets once per month to discuss its plans for the next parish council election in May 2012 when it intends to offer residents a manifesto to reduce substantially the running costs of the Joint Parish Council and to give greater participation to the community in the affairs of the town. 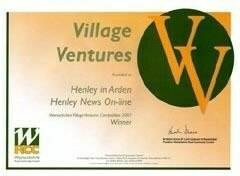 Henley NEWS Online was the outright winner of the Village Ventures competition 2007 and awarded Bronze Certificates in 2009 & 2010.